I have really been into creating Tablescapes lately, maybe it’s because the weather is getting warmer and the days longer so I am feeling inspired. Does the change in seasons inspire you too? 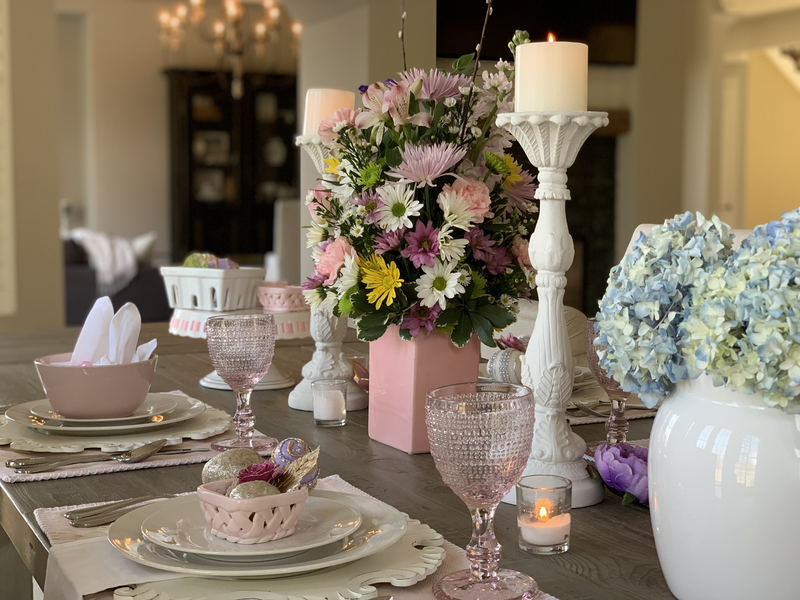 Last week, I shared 7 Tips to Setting an Intimate Spring Table, the setting was in our dining room and more formal, using crystal and fine china. The one I am sharing today is casual, using everyday dishes and dining in the kitchen. I centered the place settings around a Spring centerpiece I put together using daisy mums, carnations, snapdragons, casino, and alstroemerias. Spring flowers are abundant this time of year and so many choices from which to choose to create a pretty arrangement. I found these cute weave baskets at Home Goods HERE and filled them with decorative Easter items. These Spring items from Pier 1 HERE are so pretty and can be used in a variety of styling ideas. The set includes sparkly eggs, flowers, leaves, and a dragon fly I placed on a candle. I have also used the items in a glass jar as a poupourri accent in a room. These white chargers from Pier 1 HERE are also among my favorite table accessories. The decorative scalloped edges make any setting pop and look amazing with a variety of plates. I use them everyday in our kitchen in lieu of placemats, they protect the table and are very easy to wipe and keep clean. In this setting, I placed a white cotton napkin under the plate and on top of the charger. It’s fun to set each place setting a bit different, changing up the napkin style or adding different accessories. I am also using 2 tall white candlesticks on the table that I painted a while back, you may be interested in How to Use Milk Paint to Update Decor. These fun pink glasses were a Home Goods find too. A second flower arrangement of blue hydrangeas was used in my dining room, and still look fresh and beautiful, so they found a new home in the kitchen. If your hydrangeas wilt after bringing them home from the store, check out How to Bring Wilting Hydrangeas Back to Life. A cake stand is a great way to display Easter items on a table, bring in more color and add height to the setting. These color coated almonds are a yummy Easter touch, or you could use chocolate covered candy. So many options available this time of year. Another creative idea for an Easter table is to fold a cloth napkin into the shape of a bunny. You could also use paper napkins which are easier to fold and less work. When using cloth, it’s important to iron it each time you create a fold. And lastly, kids love to add their own Easter touch to a table. My son has enjoyed creating his own egg surprises by blowing out the insides. Using a pin to create a small hole at the bottom of the egg, he blew out the egg white and yolk leaving just the shell. He colored several eggs blue, yellow, and pink and created this little guy holding a basket with pipe cleaners. Just a few ideas for a casual Easter table, how do you set your Spring/Easter table? Would love to hear from you! For more posts about table setting ideas, please subscribe to Happy Haute Home and follow along on Pinterest HERE, and Twitter HERE and feel free to pin and tweet your favorite pics from Happy Haute Home. You can also get daily home decor inspiration by following along on Instagram HERE. If you use any of my tips to make a Spring table, tag me on Instagram, I would love to see it! Aw 😊 thank you! I enjoyed writing it and putting the table together. Great ideas! Love the chargers and I also like your idea of making each place setting a little different! Hi Kristin, yes the chargers are really nice. Great quality and style make them an easy choice for my table. Thanks for dropping in. Not sure my teenager feels the same way 😂 But thank you my friend.